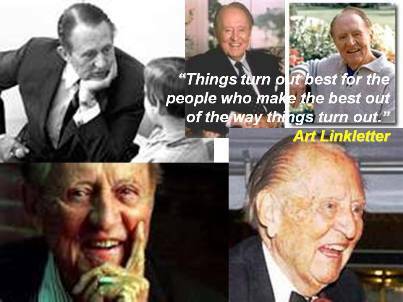 Art Linkletter, the genial host who parlayed his talent for the ad-libbed interview into two of television’s longest-running shows, “People Are Funny” and “House Party,” in the 1950s and 1960s, died on Wednesday at his home in Los Angeles at the age of 97. Having lost his daughter to drug-induced suicide, one son to a traffic accident and another to lymphoma, Art knew grief. “But I’m an optimist. Even though I’ve had tragedies in my life, and I’ve seen a lot of difficult things, I still am an optimist,” he claimed. His losses led him to dedicate his life to make a difference. Art Linkletter once said to an audience of teenagers and the parents at the Pepperdine University Youth Citizenship Seminar (YCS), “If you’re cheerful, happy, optimistic, have a sense of humor, stay curious, persistent and determined to win—you’re going to live longer. And you’re going to be happier doing whatever you do.” His wife of over 70 years was in the audience beaming as he engaged and entertained the audience. As he loved to say, “Things turn out best for the people who make the best out of the way things turn out.” That is optimism in action. As a speaker at the same event, I asked him how he prepares to speak at 96. He replied with a smile, “I don’t have to. Everything I say reminds me of something else. I just have people give me a three minute warning, and I wrap it up.” The teens in the audience had never seen his famous shows, but they were still entranced by his engaging stories and vital life. At 96, I remember him saying, “I’m excited as I have ever been. I’m involved in a start up in China to bring energy to rural areas.” This man got involved in a startup in his nineties. Now, that’s optimism. Although not confirmed, Art Linkletter loved to say that he was asked to be the keynote speaker at the grand opening of Disneyland. Walt Disney was in debt up to his ears and could only pay Art the minimum union pay scale. Art’s fees at the time were HUGE, he was the Oprah of his day, the most popular man in television. Art agreed to do the speech for scale plus….the camera and film concession at Disneyland for the first ten years! If that story is true, that was probably the largest speaking fee ever paid. But money was not the measure of the man. Art Linkletter was fully used up when he died. He was making a difference to audiences every chance he had until the year he died. We will miss him. As I describe in my new book, The Optimism Advantage, Art was an optimistic realist who knew that life could bring you pain, but that you could overcome whatever life sent your way. May we learn from him…and never forget to laugh a lot along the way.